Jujubee’s 2017 release, RealPolitiks, is a macro-scale political strategy game where you pick a country and make decisions for the 21st-century. Your ultimate goal is to lead the world in the game’s ranking system, by the end of a hundred years or so. The name is a play on the German term, Realpolitik, which describes a system of government that works on cold facts rather than ideologies, whether religious or otherwise. To this end, RealPolitiks has many mechanics to build up your country, and based on decisions you make and tasks you complete, the government you shape will be labeled either Democratic, Authoritarian, or Totalitarian. Bear in mind, your politics are never set in stone. 100%? Grats. Your country takes over the warring territory. While Realpolitiks has many mechanics for international relations, there is also a plethora of options that allows for domestic policy, ranging from military projects to social reforms. These different avenues are taken by completing “Projects,” which cost money, another form of in­game currency called “action points,” and time. Depending on the projects you pick, it can positively or negatively affect unemployment, GDP growth, general unhappiness, military growth, and other key factors that affect your country’s standing. Some projects will even award some gold stars, boosting your international ratings. 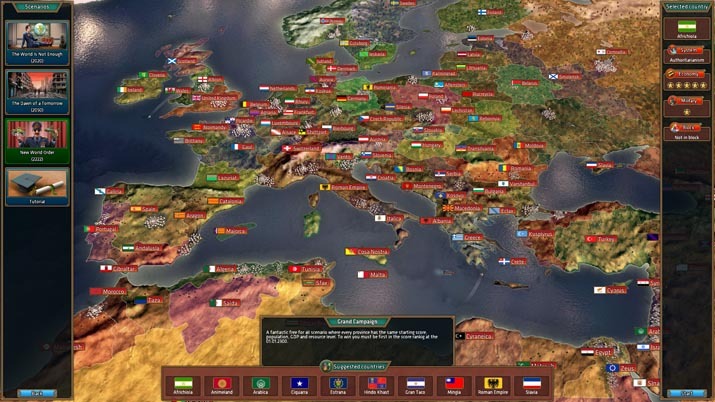 In sum, RealPolitiks is much like other grand strategy games in terms of features and mechanics, but after playing it some, you might consider it a misnomer: it tends to railroad you into different repeating scenarios that may or may not have any political or diplomatic justification in a particular space or climate. 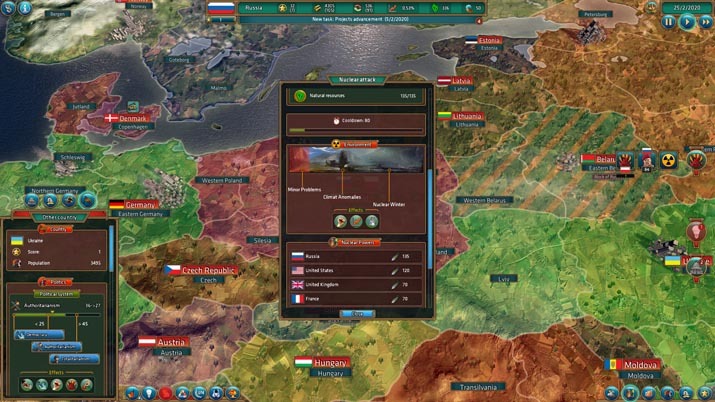 It does come off as more simplistic in theory than most titles of its type, but in fact, RealPolitik’s gameplay can be frustratingly complex. The first word of advice is not to skip the tutorial, but don’t expect it to clarify much either. For some relatively simple aspects, it will give you several paragraphs of a rundown, but for more complex mechanics, little to no information is given at all. 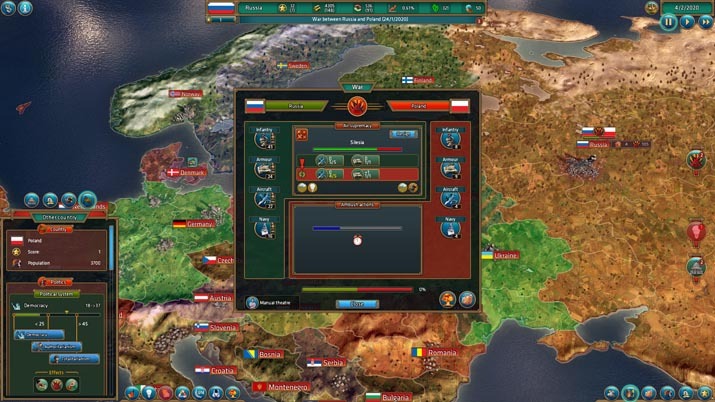 A tutorial allows you to dive in step­by­step, starting as Poland and going through a typical run-through of what you might accomplish in a future campaign. The educational material is fed in a written form mostly and feels more like hefty instructions than it does a game. It also deadens almost all buttons except the ones you’re mechanically asked to click, thereby negating the exploratory impulses players generally have toward discovering game mechanic. This wouldn’t be annoying if the tutorials weren't so gruelingly long and wordy, but they are, and to make matters worse, certain tasks take an excessive amount of time to process; though there is a speed to hasten the “normal” settings, I still found myself sitting for minutes at a time, waiting for a project to be completed. The object of RealPolitik is to end an era with the highest score in the world. Completing projects and tasks will give your country “stars,” which can also be taken away when you refuse to complete tasks, when you anger the United Nations (UN), or from other random events. Such a system in place seems, at first, an elegant solution for players unsure what to do next, but ultimately, it’s what turns the game into a series of errands rather than a strategically complex and immersive political sandbox experience. It’s hard to find a connection between the tasks you’re fed and your plans and aspirations for your country’s progress and evolution. In some cases, these tasks are impossible to complete. For instance, I was repping the motherland in Russia, building education and research for the space race, when a task popped up telling me to go to war with Latvia. Russia could then claim the territory again. It was an odd request, not only because I had been running a pretty peaceful regime up until that point, but also because Latvia didn’t exist at the time the task was handed. I wanted my gold stars, however, so I fought the Baltic Union in which a forming Latvia resided, and enveloped it into Russia, only for the task to remain unticked. To deepen my frustration, I received a “Warmonger” status from the UN, and so, I paid the penalty with gold stars, consequently resigning from completing the task. An obstinant request to conquer Latvia buggily popped up some 3 more times.